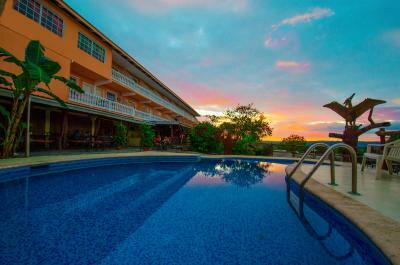 Lock in a great price for Cahal Pech Village Resort – rated 8.3 by recent guests! 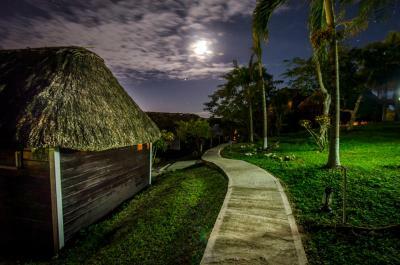 The ambiance, the nature, CAYO! Beautiful property and views. Everything was great. All of the staff were fabulous. From our pick up at the airport, the front office, the bartenders, wait staff and everyone we talked to, they made sure we had everything we needed to have a wonderful trip. Good excellent, comfortable room, great view of city. This was my grandson's first trip out of the US. We could not have asked for a better place. Food was amazing. Our cabana - I have no words! Staff was bend-over-backward accommodating - they remembered our names from the first day and never forgot them or our beverage/food orders. Excursions, both organized by the hotel and our personal "hey, can you recommend a cab driver for the day" -were great value for the money and well organized. This was an absolute success. Cahal Pech completely exceeded our expectations. The location was beautiful, convenient, and the staff were incredibly helpful and kind. We booked a tour of ATM cave through the hotel and our guide, Basilio, completely made the trip for us. He went the extra mile to give us a completely personalized experience and was so knowledgeable and fun. We came to Cahal Pech for the ATM cave experience and cannot say enough good things! I liked the bungalows, they were just as advertised. The views were beautiful at any time of the day. The pools came in handy at the end of a long day in the heat. The bar drinks were pretty inexpensive. The airport shuttle they run is very convenient. They’re willing to work with out about times and finding others to ride with you to make it cheaper for everyone. The staff is pleasant! When told about the bugs that were in our screened in porch, they came out quickly to get them out. We like the view of the town below from the resort. The staff were friendly and helpful. We stayed in a cabana near the lower pool and it was very comfortable, although the chairs on the nice deck left something to be desired. The bed was very good, but the shower temperature was very difficult to control. It would be nice to have a fridge and coffee maker in the room as well. The staff was so accomodafing and really went out of their way to make your stay and travels as convenient as possible! 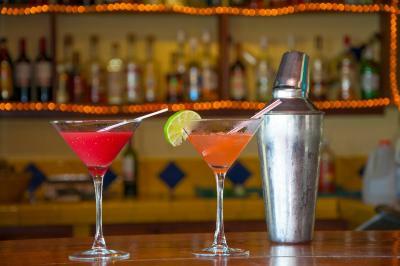 If there is something you want to do in San Ignacio, they will make it happen. The grounds are beautiful, but could use some updating to make it more modern (ie. Pool chairs). The food at the resort was good! Loved the screened in porch in the cabana. 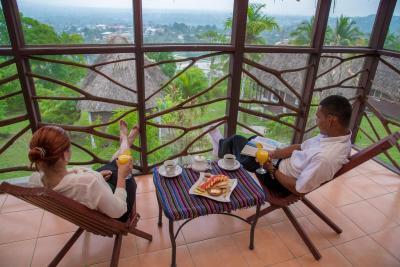 View from the resort is the best in San Ignacio and the ruins next door are convenient for right when you get there. 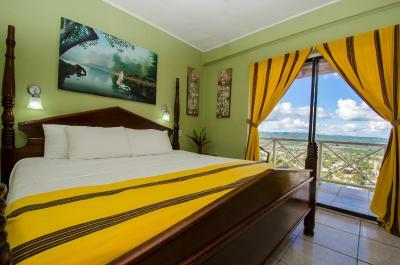 Cahal Pech Village Resort This rating is a reflection of how the property compares to the industry standard when it comes to price, facilities and services available. It's based on a self-evaluation by the property. Use this rating to help choose your stay! One of our top picks in San Ignacio.Located in San Ingnacio, this rustic-style resort features spectacular views of the Belize River Valley and offers guests free Wi-Fi and an on-site restaurant. 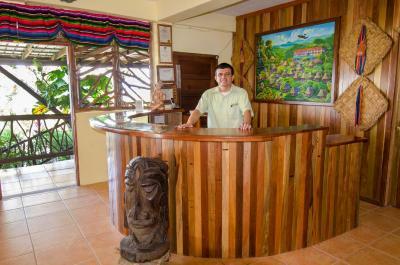 Cahal Pech Village Resort also has a tour desk. 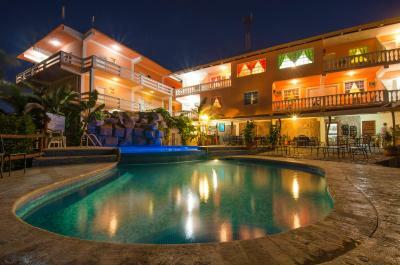 Each suite and room at this property is totally air-conditioned and comes with a cable TV, a wardrobe and a balcony. The private bathrooms feature a shower and toilet. Suites are also offered. 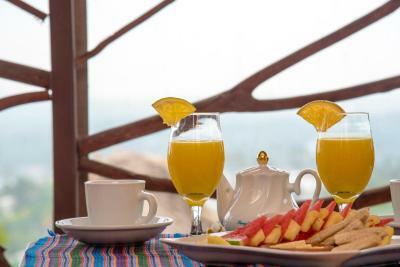 Local cuisine is served at the on-site restaurant, while guests will find other restaurants, many offering international cuisine, within a 10-minute walk. 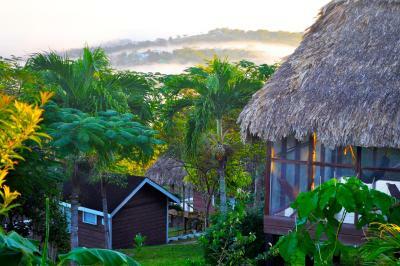 Cahal Pech Village Resort can organize canopy tours and nature outings, or guests can relax at the outdoor swimming pool. Massages and other spa services can also be arranged. 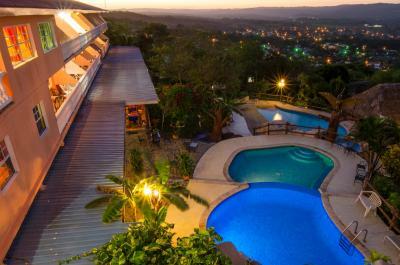 The Cahal Pech Mayan Ruins are a 5-minute walk from the property, while Philip SW Goldson International Airport is a 1.5-hour drive away. 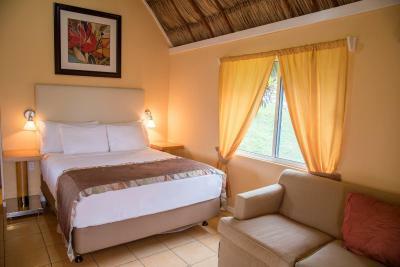 When would you like to stay at Cahal Pech Village Resort? This room is equipped with a cable TV, a wardrobe and a balcony. 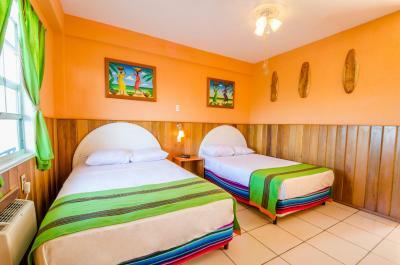 It is totally air-conditioned and features a private bathroom with a shower and toilet. This bungalow has air conditioning, tile/marble floor and cable TV. 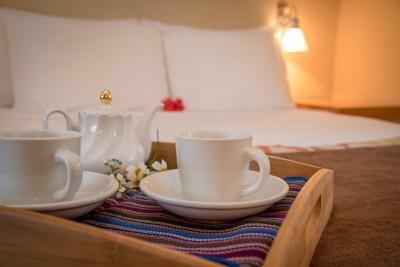 House Rules Cahal Pech Village Resort takes special requests – add in the next step! Free! Up to three children under 3 years stay free of charge when using existing beds. 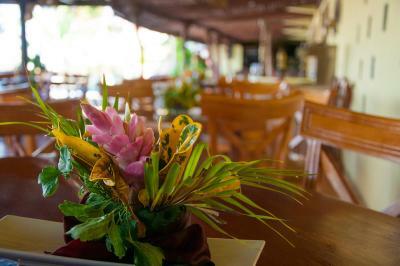 Cahal Pech Village Resort accepts these cards and reserves the right to temporarily hold an amount prior to arrival. Beautiful hut & pool. Great food!!! ALOT: Food was ridiculously overpriced ($5USD for 2 eggs!). Amenities were insufficient: the TV was tiny, no mini-fridge (had to walk up the steep hill for ice and water repeatedly), no safe, no iron, no phone to call front desk. Poor shower quality, air conditioning location directly over bed (bad). For the price of over $270 USD I expected much more. Plus they take an imprint of your credit card (not very hospitable) and don't even wait for you to finish eating before they request "cash or credit". Quite the hill walking back from town, however they even helped us with a taxi. And the hill is what makes the property so great. The views are beautiful. Some rooms not great for individuals with bad knees. A lot of steps and very high entrance to shower. Problems with a/c and water. Near Cahal Pech archeological site and great view. It would have been nice to have airport pickup included in the hotel package. It was a decent breakfast for days where we have a tour booked. However, for $20USD, we could've gotten breakfast down the hill for a fraction of the price, and it would've been just as good (if not better!). The food was not our favorite in San Ignacio. It was a little pricey. The food in town was more reflective of the local taste. There weren’t enough pool lounger chairs. The water in our bungalow was either cold or scalding hot, no real in between. If you have an early tour they won’t have breakfast before 7am so you’re on your own. I wished the restaurant had more local food options but overall really good! Loved the location, the staff was friendly helpful and genuinely wanted to make sure we were happy and enjoying our time. The tour option was amazing value and took all the thinking away. We enjoyed every one we joined. The bathroom door didn't close all the way. Other than that no complaints! 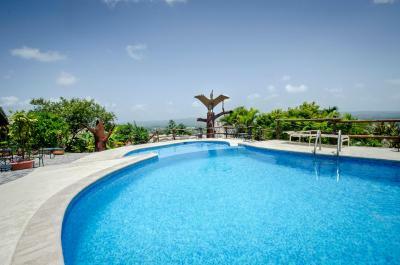 Friendly staff, great location on top of the hill overlooking the city, and the pool was awesome! 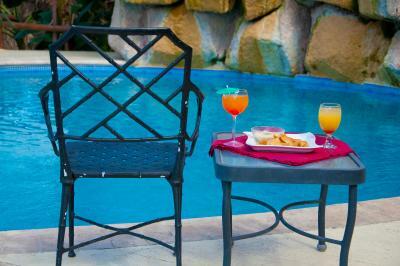 They had a great breakfast in the morning and the pool side bar was definitely a plus! You need to take a 7 minute taxi ride to the main part of town . One way costs 5.00US or 10 BZD Although in daylight you can walk down and up . The WIFI was weak in the bungalows and the tap spout were too close to the sinks. There is no safe in the room but you can bring your valuables to the front desk to be locked up when going off the property. Pricey food but good . Paid 10: 50 for order of toast which I had to toast when the whole breakfast was 20.00 The road into the resort was steep and rough to drive on. They were doing constrution on the new wing so alot of banging early in morning. Scenery was beautiful. Pools were nice but could use a little more cleaning. The staff were excellent frendly and helpfull. Beautiful weather everyday.